Ames, located in the heart of Iowa, is just 30 miles north of Des Moines and home to Iowa State University. The city was founded in 1864 as a station stop along the Cedar Rapids and Missouri Railroad, and was named after U.S. congressman Oakes Ames of Massachusetts who had a significant impact on the railroad system. Today, Ames is home to almost 60,000 residents, making it the second-fastest growing city in Iowa. 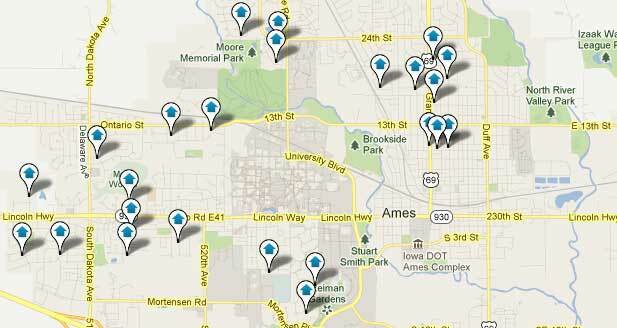 Ames has 36 parks offering a variety of recreation opportunities. This includes Ada Hayden Park featuring hiking and bike trails, hundreds of acres and prairie, and boat access to the 130-acre lake. More than 28,000 students are enrolled at Iowa State University, the school renowned for agriculture, architecture, engineering and marketing programs. Located on campus is Reiman Gardens, a 14-acre year-round site featuring a 2,500 square foot butterfly wing. The Iowa State Center brings world-class performing arts to Ames and houses the Brunnier Art Museum, and sports bring another level of excitment to the area as the ISU Cyclones compete in the Big 12 in football, basketball, wrestling, and more! Other major employers include Iowa Department of Transportation, Mary Greeley Medical Center, McFarland Clinic PC, Danfoss, and REG. Ames Real Estate is the best website to find homes for sale, land for sale, and investment properties in Ames, Iowa. This website is your complete online source for information and real estate services - whether you are buying or selling Ames or Story County Real Estate. This site features the best and most advanced Ames Metro MLS and Story County Real Estate search for homes, condos and land available. This website is the only site you will ever need for all of your real estate needs. It is easy to use and features user friendly navigation for Ames area real estate searches. We have some of the Ames area's most experienced agents who specialize in all aspects of the surrounding market place. These agents represent the best and most desirable Ames and Story County homes and condos for sale daily. If you are searching for Ames real estate, you have found the correct website. Ames Real Estate's aggressive Internet marketing program and website offers home buyers and home sellers maximum exposure along with the best professional residential real estate services you need in this challenging market. The Ames Real Estate Team can help you locate and buy or sell the best Ames real estate for sale. With over 30 years of combined local experience, we know the Ames real estate market. Interested in buying or selling property in the Ames Area? Contact us today. Our website allows you to quickly and easily complete your search for, compare, and select from the most desirable Ames homes, condos and land for sale. Best of all, you can save your real estate searches and favorite homes and condos so that you can return and review them later, as well as get regular email updates of new Ames listings and price reductions. You can even schedule property showings online via our website.